The Ruth L. Kirschstein Institutional National Research Service Award will provide funding for 10 postdoctoral positions in various labs at Fox Chase for five years. Trainees are funded by the grant for a maximum of two years. Working in each of the Center’s labs are graduate students earning their PhDs and postdoctoral students who already hold a PhD but are still training. 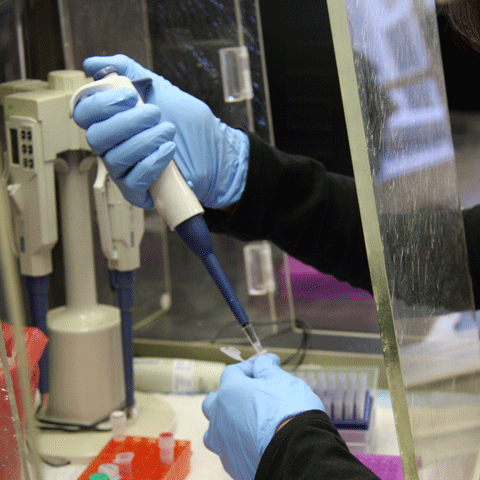 Approximately 80 postdoctoral fellows work at Fox Chase. “The real engines for progress here at the Center are our trainees,” said Glenn Rall, PhD, director of the Postdoctoral Program at Fox Chase. The critical funding provided by the grant allows for breathing room in the budget and allows principal investigators to hire other trainees, according to Rall. As part of the review process, the Application Committee looks at the Center’s track record of success and at how scientists who received funding under the grant have flourished. All members of the Application Committee awarded Fox Chase the highest possible score. Receiving full funding and perfect marks indicates that Fox Chase trainees are finding great success after completing their training, according to Rall. In addition to the challenges of working in a lab, some trainees may find it overwhelming and discouraging as they try to receive grant funding in such a competitive environment. Therefore, at Fox Chase, postdoctoral training includes education on how to write the best possible grants to get funding and how to review grants to help colleagues. Ashley Mentlik James, who works in the lab of Kerry S. Campbell, PhD, director of the Cell Culture Facility, was funded on the grant for two of the four years she has been at Fox Chase. Beyond the peace of mind of being funded for two years, trainees funded by the grant are able to get to know one another and form collaborations, both personally and professionally. Shawn Fahl has been training at Fox Chase in the lab of David Wiest, PhD, deputy chief scientific officer and coleader in blood cell development and function, for three years and was funded by the training grant for two of those years. In addition to focusing on his research, the grant has allowed Fahl to explore other professional interests, like teaching. The grant also provides funding for Rall to bring in outside speakers to talk to postdoctoral fellows about their career options, which Fahl finds especially helpful. Two years ago, Peter Huwe wanted to join the lab of Roland Dunbrack, Jr., PhD, director of the Molecular Modeling Facility, at Fox Chase but there was no guarantee that funding would be available to bring Huwe on board. He applied for the training grant, which allowed him to join the Center and the lab. The nature of the grant has allowed Huwe to explore a variety of interest areas, which has been helpful as he works on developing his career.